The earth has two equinoxes – one in September and one in March. The September Equinox will occur next Saturday September 22 at 14:49 (or 2:49pm) Coordinated Universal Time (UTC). The equinox occurs when the sun shines directly on the equator and the length of day and night is nearly equal. The twilight zone is a moving line that separates the illuminated day side and the dark night side of the earth. The equinoxes are the only times when the twilight zone is inclined 90° to the Earth's Equator. Equinox is a Latin word meaning equal night. At the cusp of the equinox, night and day are 12 hours. The equilux is a word that describes that time when sunset and sunrise are exactly 12 hours apart. Seasons are opposite on either side of the equator. In the northern hemisphere the September equinox is known as the autumnal equinox. In the southern hemisphere it is known as the vernal or spring equinox. Here in the North American continent, we are experiencing the approach of the autumnal equinox. It is a time of the year where we appreciate the remaining plant life, particularly delighting in autumn flowers. Flowers in autumn seem to grow more vibrant in color as the days and nights grow cooler - as if to defy their impending death. 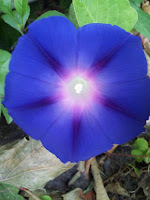 Some sowers of flower seeds bury pre-soaked and razor-scored Morning Glory seeds each Spring in a sort of long-view anticipation of the short window of their bluish-purple bloom in late summer and early autumn. Many of the uncertainties we fret about have no permanence; like autumn flora they gradually pass away. In the natural world, the autumnal equinox is a time for scattering and sowing seeds. For humans, the autumnal equinox is a time for reflection, for renewing attentiveness, and for appreciating all that's fleeting.